Fusing folk, jazz and pop styles, two-time Grammy-winner Laurence Juber creates a multifaceted performance that belies the use of only one acoustic guitar. 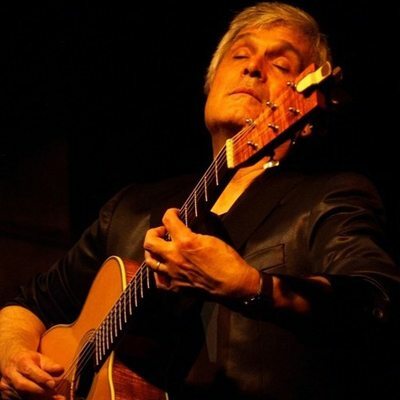 First internationally recognized as lead guitarist in Beatle Paul McCartney’s band Wings, Laurence Juber has since established himself as a world-renowned guitar virtuoso, composer, and arranger. Juber, known to his fans as LJ, has released 23 solo albums which spotlight Juber’s unique touch and tone on solo acoustic guitar. The latest is Fingerboard Road, featuring thirteen tunes that encompass a spectrum from those that have a deep personal resonance, to others that are representative of particular styles or musical eras, mostly 1960s and ‘70s, the period when he ‘came of age’ as a musician. His ‘photo memoir’ Guitar With Wings is published by Dalton Watson Fine Books in a numbered limited edition and as a standard hardback. LJ Plays The Beatles, was voted one of Acoustic Guitar Magazine’s all-time Top Ten albums. Juber’s solo arrangement of The Pink Panther Theme earned him a second Grammy. His arrangement of Stand By Me was heard nationally in a Diamonds Are Forever commercial. His DVD-Audio project Guitar Noir (AIX Records) won a CES Demmy award for best sound. As a studio musician, he can be heard on recordings from artists as diverse as Dan Hicks & the Hot Licks, Seal, and Barry Manilow, plus he is featured on the soundtracks to hundreds of TV shows such as Home Improvement and movies including the academy award-winning Dirty Dancing, Good Will Hunting, and Pocahontas. Juber co-composed the soundtrack of the award-winning video game Diablo III and crafted the score to the NBC Dateline documentary Children Of The Harvest. His music is also featured in the Ken Burns’ documentary The Tenth Inning. With his wife Hope Juber, he has composed the scores to the musical comedies Gilligan’s Island: The Musical, A Very Brady Musical, and It’s The Housewives!